Burst Arts are special techniques that alter your techniques so long as you have Burst activated. 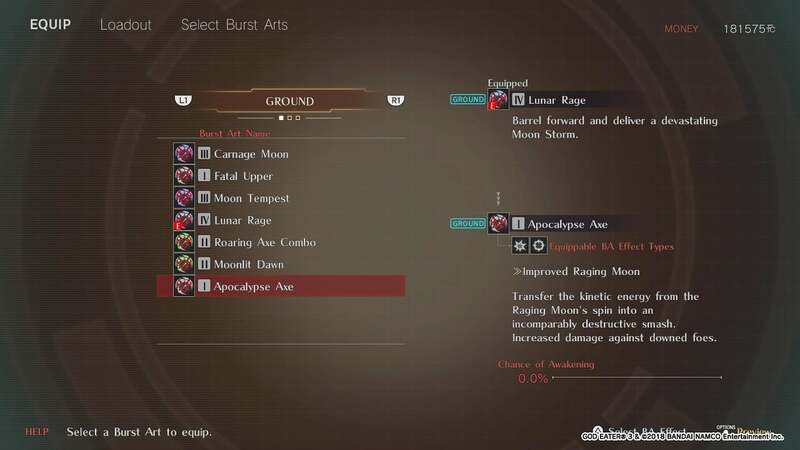 These are reminiscent of Blood Arts from previous entries, but you can now have up to three BAs equipped — one for ground, aerial and step (dash) — at one time — instead of the previous one. These can be applied to essentially any of your regular attacks, so all you really need to do is find which ones work for you and stick with them. If you do, they’ll eventually increase in power and you’ll unlock new ones to pummel Aragami with. In order to unlock more Burst Arts, all you have to do is use the ones you already have. Luckily, the game tells you what Burst Art needs to be leveled up in order to gain a new one, so there’s no guesswork involved. You’ll need to raise a Burst Art to lvl 3 at the most in order to unlock another one. Though do keep in mind that just like with Acceleration Triggers, you get less experience towards powering up your Burst Arts on lower ranked missions, so don’t think you can farm them in order to quickly level up your BA’s.